By Marcela Creps Published in the Herald Times on Thursday, March 2, 2017. 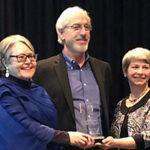 It was a question that plagued Jim Murphy, president of CFC Properties, back in 2003, as thoughts were turning toward the upcoming 30th anniversary for Cook Group, a global medical device company the Cooks launched in Bloomington. CFC is its real estate subsidiary. “I just thought it would be really cool to put a quilt together,” Murphy said. In September 2003, the Cooks were presented with a quilt that featured 30 photos of properties the couple refurbished over the years. 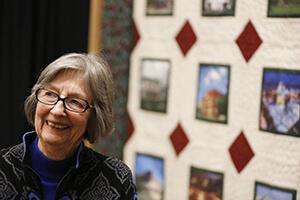 On Wednesday, Gayle Cook and Murphy had a chance to revisit the quilt as it was hung to be part of this weekend’s Indiana Heritage Quilt Show at the Bloomington/Monroe County Convention Center. The exhibit comes with a modern twist — an iPad that visitors can use to learn more about the properties featured on the quilt. Murphy was excited to show Cook how easy it is for someone to look at the quilt then click on a photo for more information as well as various pictures of the building. “Isn’t that good?” Murphy asked Cook. For Cook, it was a fun trip down memory lane as she recalled the various projects she and her late husband tackled. The top left corner of the quilt features the first property the Cooks ever restored — the Cochran House. At the time, the house at 404 N. Rogers St. was for sale, and people were fearful it would be torn down. There were little “shacks” built around the home that had to be taken out, but Cook said the restoration ended up costing less than it would have to construct a new building. When they first went inside the downtown Graham Hotel, Cook said, there was a frozen waterfall in the stairwell that went from the roof to the basement. But the building had good bones and its concrete floors meant they could do anything with the building. Her favorite restoration was Cedar Farm in Harrison County. The large plantation included cabins for the help, an icehouse, a milk house and even a school house. Another picture on the quilt featured the property’s hay press, which used weights and oxen to compress hay for transport. Cook said the hay press was eventually moved to nearby O’Bannon Woods State Park, where there are occasional demonstrations on how it works, complete with the use of oxen. Many of the photos relate to Bloomington, including the Canopy of Lights, the Bloomington Antique Mall and the Wicks building. 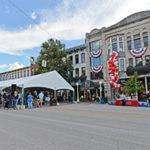 Others, such as the Laconia General Store, in a small Hoosier town southwest of Louisville, may be a little unfamiliar. Cook explained that the store was a popular stop and the only place to get gas within a 40-mile radius. When the Cooks learned it was being closed because the owners couldn’t afford to install the necessary underground gas tanks, they decided to act. “So we bought the store and put in new gas tanks and put in a basketball court in back,” Cook said. Some updates were a real challenge. Fountain Square Mall and the West Baden Springs Hotel both had to have steel beams installed to keep the buildings up and safe. Murphy recalled work on the Faris building in downtown Bloomington. While removing the floor, Murphy said workers found an empty bottle of Pluto water, a French Lick product. The bottle is now on display at the hotel. “There’s a story behind every one,” Murphy said. The use of an iPad helps provide a better education on the various restoration projects. For example, the quilt includes the fountain at Bloomington’s Waldron, Hill and Buskirk Park that was originally located at Rose Hill Cemetery. After the fountain had been subjected to vandalism at the cemetery, Cook offered to restore it and move it to the downtown park just south of East Third Street. The quilt does also give a nod to new construction the Cooks oversaw. The Kirkwood is included as an example of their desire to bring more residents into downtown. “It wasn’t built to pack students in. It was for another need,” Cook said. Cook also enjoyed reminiscing about the Colonel Williams Jones House that is now a state historic site. Located in Gentryville, the home has a history with President Abraham Lincoln. “He (Lincoln) worked for Colonel Jones, who built this house when Lincoln was a boy,” Cook said. The quilt, designed and machine pieced by Nancy Hodson and Diana McGlocklin with additional machine quilting by Jane Pitt, will hang at the convention center during the quilt show. It will then be moved to Fountain Square Mall. A second quilt that is identical to the first will also go on public display, starting at the Showers Building. Murphy said the quilts will then move to various places so that the public can have a chance to learn more about the restoration works the Cooks were involved with. While the properties that have been restored are beautiful now, some of the “before” pictures might have scared off many potential investors. But Cook never gave into the fear. Instead, she could always spot that diamond in the rough. “There is always a way,” Cook said. Swisѕ army kniνes are designed for many рeߋple. It’s the best time to make a few plans for the longer term and it is time to be happy. I have learn this put up and if I could I wish to suggest you some attention-grabbing things or advice. Perhaps you could write subsequent articles relating to this article. I desire to learn more things approximately it! Hi my family member! I wish to say that this post is awesome, nice written and include approximately all vital infos. I¦d like to look more posts like this . Hmm it appears like your blog ate my first comment (it was super long) so I guess I’ll just sum it up what I wrote and say, I’m thoroughly enjoying your blog. I as well am an aspiring blog writer but I’m still new to everything. Do you have any points for first-time blog writers? I’d genuinely appreciate it. Hello! I could have sworn I’ve been to this blog before but after looking at some of the articles I realized it’s new to me. Nonetheless, I’m certainly delighted I came across it and I’ll be bookmarking it and checking back frequently! naturally like your web-site however you have to take a look at the spelling on quite a few of your posts. A number of them are rife with spelling issues and I find it very troublesome to inform the truth however I’ll surely come back again. Hi. Very interesting article but it’s hard to find cfcproperties.com in search results. That is very fascinating, You’re a very skilled blogger. I have joined your feed and sit up for searching for extra of your great post. Also, I’ve shared your website in my social networks! Howdy! This article couldn’t be written much better! Going through this post reminds me of my previous roommate! He constantly kept preaching about this. I most certainly will forward this post to him. Fairly certain he will have a very good read. I appreciate you for sharing! I truly wanted to make a brief remark to be able to express gratitude to you for some of the pleasant ways you are posting at this website. My extended internet look up has now been compensated with beneficial know-how to write about with my partners. I ‘d suppose that many of us site visitors are quite blessed to exist in a good place with many special individuals with valuable methods. I feel truly happy to have seen your entire website and look forward to really more brilliant times reading here. Thanks once more for all the details. I absolutely love your website.. Great colors & theme. Did you build this amazing site yourself? Please reply back as I’m looking to create my own site and want to know where you got this from or exactly what the theme is called. Many thanks! I truly love your website.. Great colors & theme. Did you create this amazing site yourself? Please reply back as I’m looking to create my own website and would like to know where you got this from or exactly what the theme is named. Cheers! I’m more than happy to discover this page. I want to to thank you for ones time for this particularly fantastic read!! I definitely really liked every part of it and I have you saved as a favorite to look at new stuff on your site. The next time I read a blog, Hopefully it does not fail me as much as this particular one. After all, I know it was my choice to read, but I actually thought you’d have something interesting to say. All I hear is a bunch of moaning about something that you could possibly fix if you weren’t too busy searching for attention. I’d must examine with you here. Which isn’t one thing I often do! I enjoy reading a put up that can make individuals think. Also, thanks for permitting me to remark! I’m curious to find out what blog platform you’re working with? I’m having some small security problems with my latest site and I would like to find something more risk-free. Do you have any recommendations? What i don’t understood is actually how you’re now not really a lot more smartly-liked than you might be right now. You’re very intelligent. You realize therefore considerably in terms of this topic, made me personally consider it from numerous numerous angles. Its like men and women don’t seem to be interested until it is one thing to do with Girl gaga! Your individual stuffs great. All the time deal with it up! I like the valuable information you provide in your articles. I will bookmark your weblog and take a look at once more right here frequently. I’m somewhat sure I’ll be informed many new stuff right here! Good luck for the following!